Welcome to the 24th Annual LIDS Student Conference! The annual LIDS Student Conference is a student-organized, student-run conference that provides an opportunity for graduate students and postdocs to present their research to peers as well as to the community at large. This year, we are delighted to welcome four distinguished plenary speakers accompanying student sessions in Optimization and Algorithms, Networks, Machine Learning and Statistics, and Control Theory and Applications. Along with a panel discussion and a celebratory banquet at Samberg Conference Center, this conference is a yearly highlight. To find out more about the Laboratory for Information & Decision Systems (LIDS), MIT's oldest lab, please visit LIDS website. Don't hesitate to contact the conference co-chairs regarding any conference-related questions. The video recordings of our plenary talks are now online! Please check out the playlist. Student talks are also coming soon! Thank you everyone for another successful conference! We are happy to announce the Best Presentation Award winner, Xiaoyue Gong, as well as the 1st Runner-up Arthur Delarue, the 2nd Runner-up Vishrant Tripathi, and the Best Poster Award winner Omer Tanovic. We look forward to the next conference! The conference is finally here! 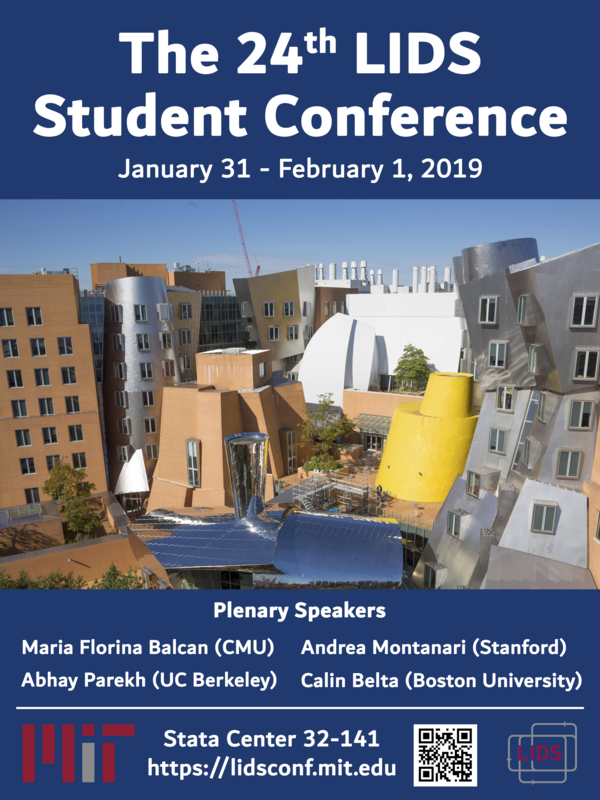 Make sure to check in at the registration desk outside of Room 32-141, MIT Stata Center. The conference is happening tomorrow! The registration is now closed. If you have any questions, please email the organizers. Details of the conference panel has been posted. Check out the bios of our panelists! The conference is quickly approaching! Check out the information about plenary talks and the abstracts for student talk sessions! The conference program is now released! Check out the full program of talks and events. The registration for talks/poster presentations is now closed. You can still register to attend the conference! The registration for LIDS Student Conference 2019 is now open. Please register for the conference and sign up to give a talk/present a poster! The 2019 Conference website is now online! If you have any questions, please email the organizers.